2014 was a record year for passenger numbers at London Heathrow Airport, with over 73 million travellers passing through the airport. Like many airports, parking is at a premium and every inch of space needs to be maximised and used as effectively as possible. As part of an extensive five year refurbishment programme, the airport needed to upgrade an existing staff car-park to provide premium business parking facilities. 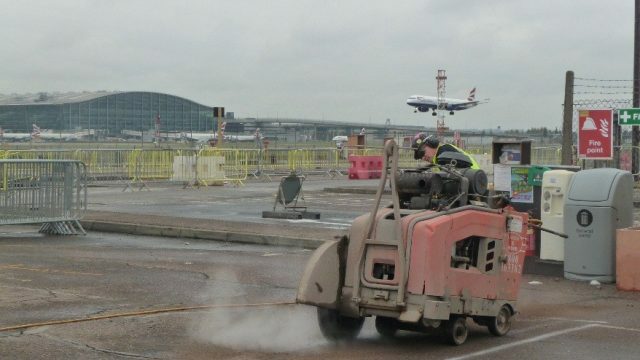 With business passengers at London Heathrow now exceeding over 30 million annually, the new car-park provides a faster, more convenient location for passengers to park close to the airport on the Western Perimeter Road. Following the relocation of the existing staff car-park, the area required full reconstruction of a concrete base and new tarmac re-surfacing. 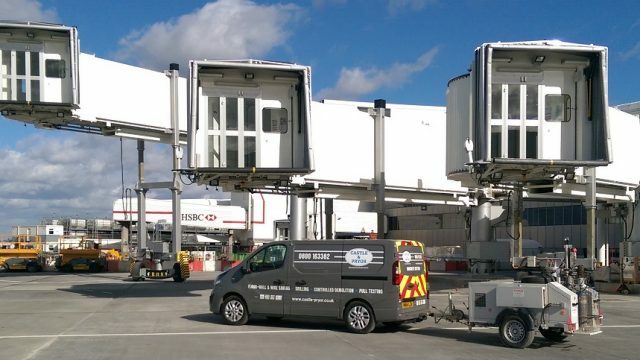 Having previously been selected for a number of construction projects at the airport, Castle & Pryor were delighted to be commissioned again and to work alongside other respected contractors, including Careys Plc, an independently owned UK construction company. A key challenge for this project was navigating the sub-terrain cables and ducting in the airport vicinity and its perimeter. Concrete cutting blades and drill heads can destroy ducting and cables in seconds, with disastrous consequences. Avoiding these ‘service strikes’ was vital to the success of the project. First, a specialist cable detection supplier was sub-contracted to identify the type of service cable and ducting beneath the surface. This built a detailed map from which the markings could be made for cutting and could identify the exact depth needed for accurate and safe concrete drilling and cutting. This information was analysed during our regular ‘strike briefings’ with our supervisors and operatives to ensure everyone was aware of the challenges so that the team could proceed safely. Diamond floor sawing with a Husqvarna FS6600-36 was utilised to cut the concrete to a depth of 300mm, creating chases in excess of 2,000 linear metres. 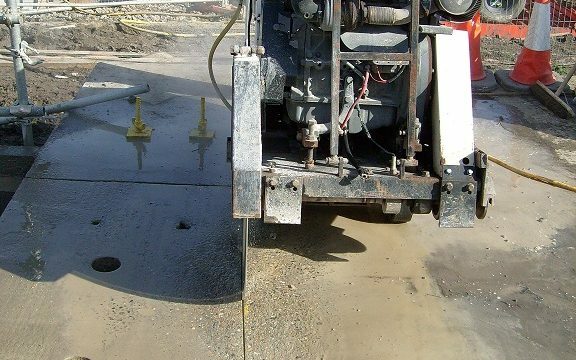 This technique lends itself to faster and more efficient removal of concrete and materials within the chase rather than cutting to the immediate depth of 300mm. A score is made along the marked-up line so that a permanent mark is achieved. Once established further incremental cuts are made until the full depth of 300mm has been completed. The 900 diameter saw blade is impregnated with diamond segments that are positioned in such a way that water can pass through the segments and enable cooling. This is referred to as ‘wet’ cutting. The diamond blade is known for its versatility as it can cut through reinforced concrete, tarmac, masonry and most robust materials, making it highly desirable in deconstruction work. The project was delivered on time and budget and the new car-park is now fully operational, helping passengers to get from their cars to their flights with the minimum of hassle.